For the first 00-7th of the new year, I want to recall the first on screen appearance of Daniel Craig’s James Bond. Casino Royale begins like no official Bond film has before it – in black-and-white! A much older man (Malcolm Sinclair) – clearly a spy but certainly not Bond – covertly boards an office elevator during a snowy evening in Prague. As the man steps into his darkened office, we immediately learn that his name is Dryden and that he’s been betraying M by selling secrets… thanks to James Bond, sitting in the shadows. A seasoned MI6 pro, Dryden subtly opens his drawer to reveal his own pistol while easing in behind his desk. This is straight from Ian Fleming’s 1953 novel, where Bond described his first two kills – a Japanese spy and a Norwegian double agent – that led to him receiving 00 status. I know where you keep your gun. Suppose that’s something. Dryden resigns himself to his fate and determines that he will die with dignity, helping Bond through the moral entanglement that comes with a 00’s second kill. Of course, this is a new Bond and not one that concerns himself with his own feelings after beating a man to death in a dirty bathroom. Our introduction to 007 in Casino Royale uses his costume to firmly establish both the character’s brash and tough youthfulness while evoking his naval background with a timeless navy pea coat layered over a cardigan and t-shirt. This is the first time we see James Bond wearing a traditional pea coat, although certainly not the last as the enduringly popular Billy Reid coat from Skyfall proved. This pea coat is classic in every sense from its dark navy blue wool melton construction to its double-breasted layout. The eight front buttons are dark horn rather than the traditional anchor-decorated plastic, and the wide Ulster collar has a small metal throat latch that goes unused as Bond wears the front of the jacket totally open. Though his non-00 status doesn’t quite intimidate Dryden, Bond’s dark layers add a menacing and mysterious appearance. Although the finished film is presented in grayscale, promotional photos inform the colors of the garments worn on screen. The heavy ribbed knit cardigan that Bond wears under his pea coat is charcoal with a tall standing collar that would have made him the toast of Transylvania. The cardigan has five large black plastic buttons – each reinforced on a stitched square – up the placket from the ribbed hem to the neck of his ribbed collar, which is left open to flap over his pea collar. The sleeves are cuffed back over his wrists, best seen when he raises his pistol to shoot. More details can be seen in a photo posted by user Kittlemeier on a AJB007.co.uk forum where he identified the garment as one also worn by Daniel Craig in real life. The heavy ribbing on the collar, hem, and cuffs are seen well in this photo, as well as the square stitching that reinforces the buttons. The sweater also has set-in sleeves and two patch pockets on the hip with ribbed open tips that each slant slightly back. Craig later wears another dark cardigan ensemble when standing on his hotel balcony with Mathis, and I imagine that oufit uses the same base layer of dark gray t-shirt, gray trousers, and black shoes under a different cardigan. The fitted cotton t-shirt is likely the same dark gray t-shirt seen in this scene, and it is almost certainly one of the many Sunspel shirts that Craig wore in Casino Royale. A full-color promotional photo showcases the colors of Bond’s assassination attire. Bond likely also wore the same lower half of this outfit when “visiting” M in her London flat. If so, his wool flat front trousers are a black-and-white glen urquhart check with a subtle light blue plaid overcheck. I surmised in my earlier post that these trousers may be from Ted Baker. He doesn’t appear to be wearing his Vega IWB holster clipped to his belt – and, in fact, may not be wearing a belt at all – since he places his entire Walther P99 (suppressor attached!) inside his jacket before leaving Dryden’s office. The bottoms of the trousers are finished with cuffs with a short, high break that shows off his black socks and black leather shoes, likely the same black calf John Lobb “Romsey” two-eyelet chukkas that he wears in M’s flat. Bond’s “theatrics” of a confrontation from the shadows may not scare Dryden initially, but the guy sure starts shitting his pants when he realizes his gun isn’t loaded. Bond’s watch remains unseen under the sleeves of his jacket and cardigan, but he is likely wearing the Omega Seamaster Planet Ocean “Big Size” 2900.50.91 that he wore in all of his early Casino Royale scenes… unless it was given to him after this as a “Congrats-on-your-second-kill-to-become-a-oo” gift. 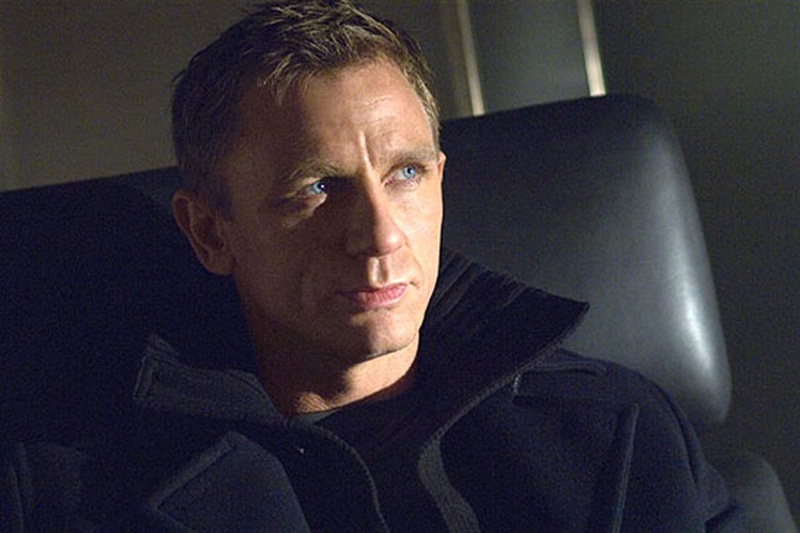 Daniel Craig’s 007 injects youth into an outfit centered around the stylish but centuries-old pea coat. Instead, Craig’s Bond maintains his armament as established by Pierce Brosnan in 1997’s Tomorrow Never Dies – a Walther P99 semi-automatic pistol, chambered in 9x19mm Parabellum. Given the context of the scene, a covert assassination in an office building, Bond’s use of a suppressor is certainly appropriate. “Yes… considerably.” Bond decocks his P99 after shooting Dryden. 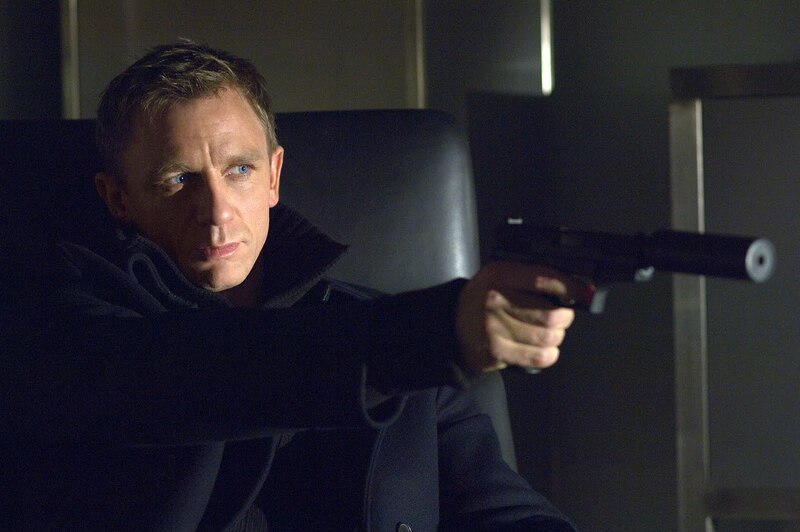 Although the P99 is technically his primary weapon throughout Casino Royale, he does appear to be using a Walther PPK during the intercut sequence that shows him killing Dryden’s contact, the traitorous Fisher. Craig’s Bond would adopt the PPK as his sidearm of choice, without explanation, in the next film, Quantum of Solace. M doesn’t mind you earning a little money on the side, Dryden. She’d just prefer it if it wasn’t selling secrets. I read on another website that the peacoat used for this scene in Casino Royale was the Belstaff “Brentwood Tailored” pea coat. It certainly looks very close from the pics I have seen. Any thoughts?